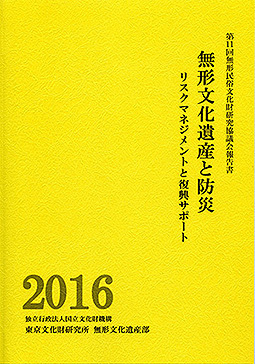 A report by the 11th Conference on the Study of Intangible Folk Cultural Properties organized on December 9th, 2016 was published at the end of March. This year’s subject is “Intangible Cultural Heritage and Disaster Prevention – Risk Management and Restoration Support.” We shared efforts and initiatives and discussed what preparations are effective to protect intangible cultural heritages from disasters that have occurred frequently in recent years, or what support can be provided after they are hit by these natural disasters. Even without disasters, intangible cultural heritages are constantly at risk of extinction. These disaster prevention efforts and initiatives can be expected to lead to preparations for day-to-day risks of extinction or decline due in part to the falling birthrate and the aging of population or the modernization of lifestyles. the PDF version can be downloaded from the website of the Department of Intangible Cultural Heritage.